Situated in Montong in West Lombok, 6 km from Senggigi Beach, Ibludan Hotel boasts a year-round outdoor pool and a garden. Free WiFi is featured throughout the property. The rooms have terraces with seating area. The bungalow comes with a dining area and a kitchen, equipped with a fridge and a stovetop. Free private parking is also available. Bed linen is provided. 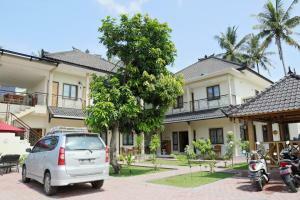 The nearest airport is Lombok International Airport, 33 km from Ibludan Hotel. When would you like to stay at Ibludan Hotel ? This double room features air conditioning, a garden bathroom with hot shower, and a terrace with a seating area. This holiday home features a well-equipped kitchen, a dining area, and seating areas. The unit is fan-cooled and has hot water shower. This twin room features air conditioning, a garden bathroom with hot shower, and a terrace with a seating area. Each day we'll check prices and send you an email for your selected dates at Ibludan Hotel. If you don't have specific dates but would like to check prices for say next weekend or say next month we can check the price too. Click to write a review and share your experience of Ibludan Hotel with other travellers.